I love to try new products and I found something that is new to me – and is great tasting! Loeb’s Onion Crunch. It is great it comes in a shaker container so you can sprinkle it on anything you want ~ Salads, pizza, baked potatoes, pizza, just about anything you can think of. Loeb’s Onion Crunch® is a crispy, fried onion topping made from onions that are naturally low in carbs, low in sodium with no cholesterol and 0 grams of trans fat. Made from 100% real onions they are a great addition to your favorite foods and recipes. French Fried Onion Topping. I have only tried the Original ones and they were great – I have a container at work and eat them on my salads for lunch. I love to try new recipes too and I see there are bunch of recipes on Loeb’s Onion Crunch® site. I see a couple dip recipes that sound good and easy to make. Such as this one. In a bowl, combine the mayonnaise, sour cream, milk, salt and the pepper. In plastic bag place 1/4 cup of Loeb’s Onion Crunch®. 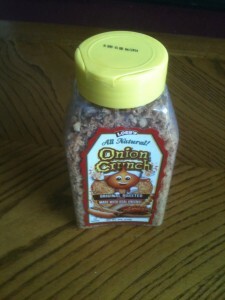 Close up the bag and crush the Onion Crunch® by hand. Add the crushed onions to the bowl and stir to combine. 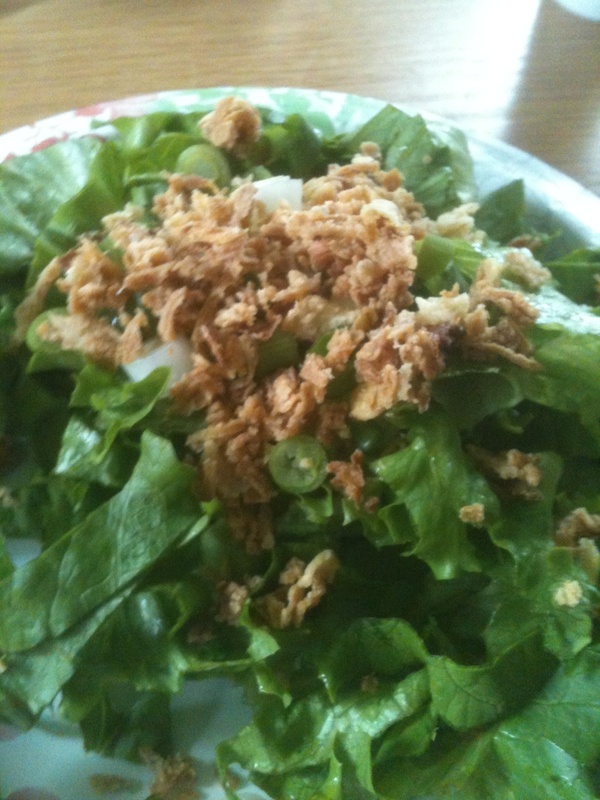 Serve with chips, vegetables and crackers. This is a one I will make the next time we entertain. Check out all the Recipes HERE. You can purchase your Loeb’s Onion Crunch® right HERE online or at many local stores including WinCo, Costco, and Walmart. 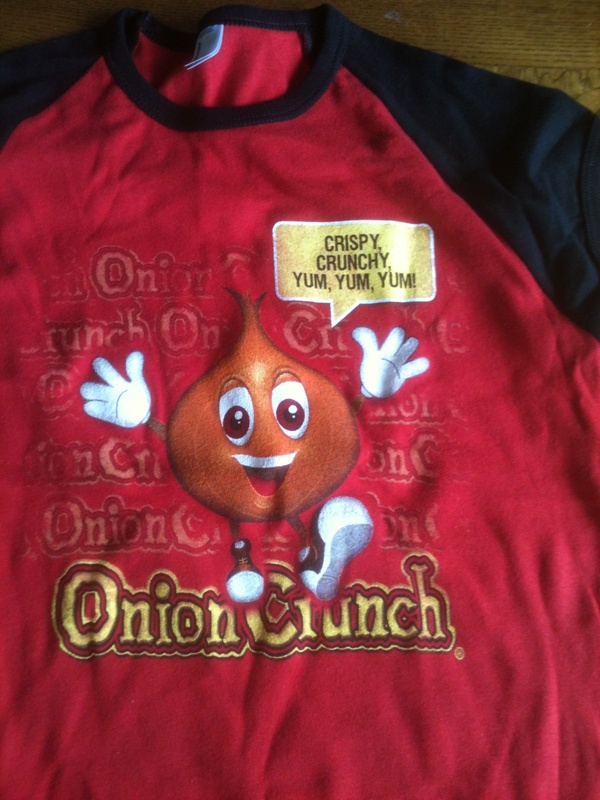 Loeb’s Onion Crunch® have also offered to give one of my readers the cute T-shirt I have pictured here and a container of Loeb’s Onion Crunch®. You must be 18+ and have a US shipping address. 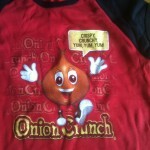 Leave a comment on what you would put your Onion Crunch on. Extra entry for Liking Loeb’s Onion Crunch on Facebook and each way you follow Kaisy Daisy’s Corner. Giveaway ends Jun 10, 2013. Sounds like a yummy addition to all kinds of dishes. Thanks for the spotlight (and giveaway)! They all sound so good! I think I would like the Chipotle Flavored French Fried Onion Topping, it would be great on a taco salad or even nachos. I’d like to use it as a coating for salmon. Sounds like it would be good on pizza. Boy, I bet this would be a WONDERFUL addition to my meatloaf – actually ALL the available flavors! I pinned this recipe! Sounds amazing. I love dips. I so hope I can find this in my stores! I’d put it on salads and vegetable casseroles. I would add this to salads. I use on salads, baked potatoes, baked squash and many more dishes that I cook. I think they add just the correct flavor that I am going for in my meals. I think it would be great on fresh steamed green beans! I’d put them on hotdogs! Thanks for the giveaway! I think I would sprinkle it on mashed potatoes. I’m curious to see how they would be on burgers. I would want to mix it with mashed potatoes! I think I would start with a baked potatoe.